Its always exciting to go to Africa. The people, culture, friends, the beautiful environments and most importantly to me, the animals. The fascination with Africa and its wildlife has enchanted me since childhood. First it was Tarzan then Mutual of Omahas Wild Kingdom, that show grabbed me, taught me and captured a kids curiosity into the animal kingdom and nature. Out in the bush I've been lucky to experience all that the African bush has had to offer. Giraffes, wildebeest, impala, warthogs, buffalo, elephants, zebras baboons even a leopard that gave me a staredown during a hike that I will never forget. The one animal that I had no idea I would be so involved with is the rhino. I've always loved the rhino but just never thought he would hold such a place in my life and in my heart. As we all know the rhino is being persecuted for his horn. The one iconic thing that he is known for,is the reason he is being slaughtered and at an alarming rate. The rhino horn is nothing more than keratin. Ones fingernails and hair have the same components, in fact the rhino horn is compressed hair. There are no magical cures nor medicinal values within the horn, yet people sought it out and on the back market it is worth more than gold. Many countries are now educating and participating to help stop the slaughtering and killing of this creature. Education is the greatest weapon and I think, our only hope. Close up picture of rhino horn. 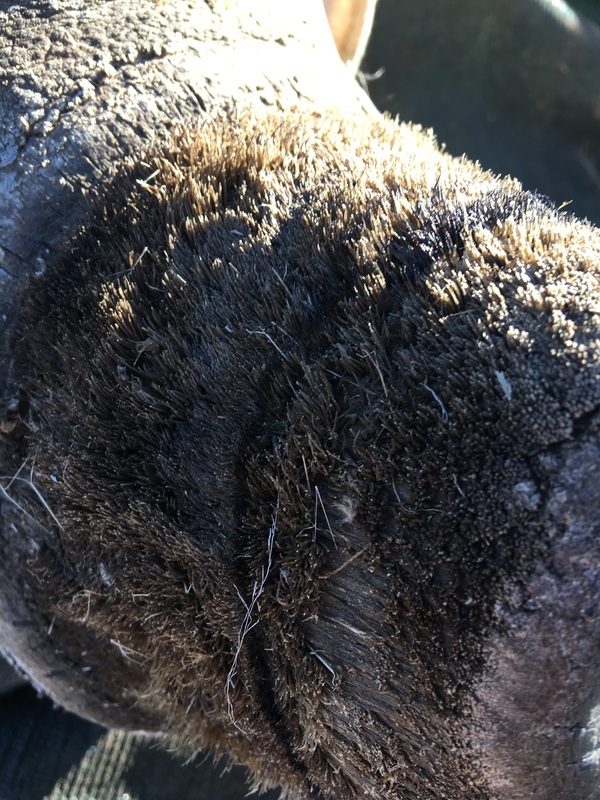 This picture shows the hair which makes up the horn. The horn consists of keratin. We worked with an amazing group in Zimbabwe called the AWARE Trust. Dr Keith Dutlow and Dr Lisa Marabini head up the organization and is the only veterinary conservation trust in Zimbabwe run by veterinarians. The AWARE Trust has been heavily involved in dehorning, monitoring and protection of the rhino within Zimbabwe. Dehorning the rhino stops poachers from killing and slaughtering the animal. It feels so sad to me that it has come to this. Removing the one thing that makes the animal iconic, its horns. Each rhino is dehorned and carefully marked in order to be recognized and accurately counted in the country. "What is done with the horn?" The horn is removed by Dr Keith using a chainsaw. It sounds horrible but its the quickest and fastest way to remove the horn and get the animal quickly back on its feet and on its way. He takes careful measurements while the rhinos is under anesthesia and stabilized. The horn is then drilled, micro chipped, sealed, scanned and handed over to the Rangers. The horn goes in a depository with Parks and Wildlife and out of AWARE Trusts possession. Our main concern is the rhino staying alive and living its full life. By dehorning and monitoring the rhinos in the area they are able to protect both the white and black rhinos from poachers and from hopefully extinction. The rhino horns are numbererd ,microchipped ,scanned and handed over to the authorities. The rhino operation to us has been an incredible experience. To be able to work up close and personal to such a magnificent animal and amazing people. Working with such an operation has put me closer to an animal I never ever dreamed of working with. Its amazing the path that life lays ahead of you. I credit all of this to art and my love of nature. Through art we developed this non profit and through art we hope to teach, educate and help other non profits with what we specialize in. Art is a loud voice that can influence. It can lead people in different paths that one does not expect. It did for me.